2016 is an extraordinary year for those with a passion for the outdoors. The National Park Service is celebrating 100 years. Fairbanks, located in the Interior of the state, is an ideal basecamp for park excursions. Explorers can plan an expedition, acquire supplies, solidify logistics, secure a guide and embark from Fairbanks and rest easy that their backcountry needs will be met. In addition to the legendary Denali National Park there are a handful of other glorious National Parks in the Interior and Arctic regions. It’s hard to go wrong with so many splendors to explore. In addition to stunning landscapes, other natural phenomena such as the aurora borealis and the midnight sun make northern Alaska National Parks even more extraordinary. The parks are mostly vast and essentially pristine wilderness – with few or no roads, trails or established campsites. For those visitors who don’t have the time or the backcountry expertise to mount an expedition into the parks, there are other options. Local air taxis provide flight-seeing trips, and outfitters guide day trips or overnight excursions to remote locations. Find Your Park: hike through Alaska’s ultimate wilderness, float a wild river, or simply listen to the call of the wild. Denali National Park, a year round destination, is home to Denali which means “the Great One” or “High One” in the Athabascan language. Rising 20,310 feet into the sky, the mountain is North America’s highest peak. The mountain is so grand that the view from the ground looking up to Denali’s epic peaks will send shivers up and down your spine. 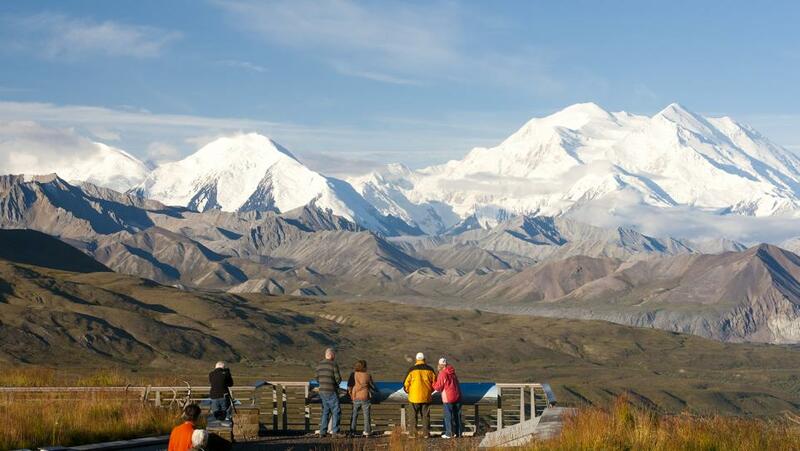 Denali National Park and Preserve covers six million acres of pure wilderness and is an easy two-hour drive or four-hour train trip from Fairbanks. Traverse the Denali Park Road in your own vehicle to milepost 14 or journey deeper into the park via tour bus. The varied terrain includes brilliant mountains, pristine rivers and lakes, colorful tundra, alpine meadows, sweeping vistas and abundant wildlife. Along the way you may spot moose, caribou, Dall sheep, grizzly bears, wolves or any of the hundreds of other species that call the park home. The Gates of the Arctic National Park and Preserve at 8.4 million acres of pristine beauty is home to a profusion of Arctic flora and fauna. Sometimes called Alaska’s ultimate wilderness the park bridges the area between the Brooks mountain range and the Arctic plains. There are no roads into the park but it can be accessed via small airplanes, floatplanes and hiking trails. The Kobuk Valley National Park is renowned for caribou and sand dunes. A half a million caribou migrate through the Park yearly, where hoof prints can be seen crisscrossing the dunes that cover much of the southern area of the Kobuk Valley. The sand was created by the grinding action of ancient glaciers and over time has been carried to the Kobuk Valley by both wind and water. The captivating Yukon-Charley Rivers National Preserve is more than 2.5 million acres and encompasses the two gold-rush towns of Eagle and Circle. At the turn of the century thousands of optimistic miners searching for that spellbinding yet elusive glimmer of gold traveled the Yukon River staking claims along the way. The preserve runs along the Canadian border where Gold seekers looking for new territory came up from Dawson City in the Yukon Territory to try their luck in Alaska. One reason the Yukon-Charley Rivers National Preserve was designated is to protect, preserve and interpret the gold rush heritage found along the river ways. Tell-tale signs of the gold rush legacy include log cabins, sluice boxes, gold dredges and tailings, mining camps and road houses. The Noatak National Preserve is an untouched river valley rimmed by mountains noteworthy for an abundance of Arctic plants and animals. The Noatak River is classified as a national wild and scenic river, and offers float-trip opportunities extending from the Brooks Range to the tidewater of the Chukchi Sea. The exquisite Wrangell-St. Elias National Park and Preserve is the largest National Park in America at 13.2 million acres. Four major mountain ranges and nine of North America’s sixteen highest peaks can be found within the spectacular park. Copper mines were established in the 1930s and the beautiful and charming towns of McCarthy and Kennicott were founded making the park accessible.